Oblíbený automatický mini tuner T1 s kapesními rozměry, váha jen 150g včetně 9V baterie. Frekv. rozsah 1,8-54MHz, výkon max. 20W. Vhodný pro libovolné transceivery. Ideální doplněk FT817/818, se kterým po propojení kabelem automaticky dolaďuje anténu podle naladěné frekvence. 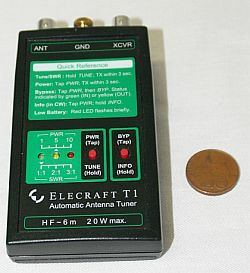 The Elecraft T1 is the only automatic antenna tuner that#s sized to match today#s small QRP rigs. It#s one-fourth the size of most other compact ATUs. And at just 5 ounces, the T1 is the ideal backpacking accessory. such as the FT-817, IC703, Ten-Tec Argonaut, SG2020, etc. SSB voice or a keyer as well as a constant carrier (AM, FM, CW, etc.). sends band data to the T1, which quickly recalls the appropriate network settings. Imagine instant QSY without the need to transmit-less QRM, less hassle! and no alignment is required.